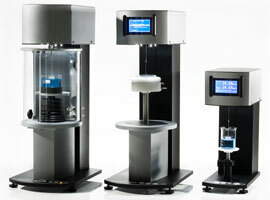 UK based Dyne Testing offer Sigma 700 and 701 force tensiometers that are a powerful and accurate technique to measure static surface and interfacial tension of liquids. These direct measurements allow determination of a number of material and surface properties, such as dynamic contact angle, surface free energy, critical micelle concentration (CMC) and wettability. This information can be used to determine adhesion, absorption, adsorption, cleanliness, surface heterogeneity, density, spreading, porosity, powder or sedimentation wettability, material solubility, biocompatibility and lubricity of solid surfaces, to name but a few. Density force tensiometry has become the method of choice for many industrial standards related to characterization of liquids. It is also the most widely used technique for measuring critical micelle concentration (CMC) of surfactants. In addition, it is the only method to determine the absorption and contact angle of a packed powder or of fibre beds using the Washburn method. The wetting of textiles and individual fibres can also be studied with Sigma force tensiometers. OneAttension is an all-inclusive software enabling immediate access to all measurement capabilities with no need to purchase and install separate software modules. It features an intuitive user interface, live analysis, configurable user groups and accounts and a preset liquid database. Any datapoints or groups of datapoints can be selected, transformed, plotted and analyzed. Data can easily be exported. In-depth analysis is now just a matter of seconds. Accessory modules for dispensers and temperature or pH control can be easily mounted into the measuring unit. In addition, special probes are available for density, wettability and tensiometry measurements as well as holders for fiber and plate studies. Two dispensers can be used simultaneously for critical micelle concentration (CMC) measurements, allowing a full CMC curve to be obtained in one measurement. 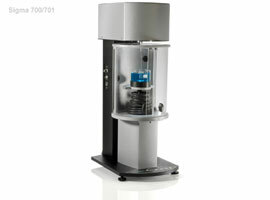 The Sigma 700 has a wide weight range and microbalance maximum load of 210g, which makes it well suited for dynamic contact angle measurements of large and heavy solid and powder samples. Sigma 701 is also a multipurpose tensiometer but equipped with a different microbalance – 5g optimized for a different range of applications. Sigma 701 can measure in a much more narrow weight range but with improved sensitivity, optimized for fiber measurements. Software modules for both models are independent and can be acquired separately, giving you the flexibility to customize the instrument to your needs. Modules are available for the following measurements: surface and interfacial tension, dynamic contact angle, CMC, density, powder wettability and sedimentation.